By Tara Kunesh M. Ed. Finding fun solo or group activities for teens can sometimes be a challenge. A little creativity, getting into the teen mindset, and asking teens for input can make planning activities fun and enjoyable for all. A simple way to update any classic activity is to add a unique twist. These tried and true favorites are reinvented for today's teenager. For some teens, a group bowling trip might sound like fun, but for others, it may feel like something their parents are more apt to enjoy. Modern bowling can be fun for all ages because of all the different kinds of bowling available. Midnight Bowling: Exactly as the name implies, midnight bowling takes place late into the night and is often marketed toward the teenage group. Teens will love the chance to stay out later than usual, even if they choose to watch rather than bowl. Glow Bowl: Some bowling alleys offer this fun option where black lights, disco balls, and glow-in-the-dark paint. White lights turn an average space into an instant party. Mini Bowling: Featuring shorter lanes and smaller, lighter balls, mini bowling adds an unexpected challenge to the classic game. Candlepin Bowling: Still gaining in popularity across the United States, candlepin bowling uses lighter balls without holes and thinner pins. DIY Bowling: For teens stuck at home or who love creative projects, there are many ways to put together a bowling match at home or school. Gather some objects to serve as pins and find something that resembles a ball. Get competitive by challenging teens to see who can come up with the most difficult lane setup or the best ball substitute. Make any bowling trip more exciting by making or finding classic bowling team shirts for everyone to wear. Create a funny team name and have each teen select a nickname to be used on the shirts and scorecard. Who doesn't love supporting the home team and getting swept up in the spirit of a crowd? While attending a variety of school sporting events can be fun, there are also many ways to enhance the experience. Tailgating: Most sports fans associate tailgate parties with national sports teams. Take any high school game or match to the next level by organizing a tailgating event. Teens can encourage friends and the community to get involved by meeting up in the parking lot before a game and serving food to share. Add in some music and outdoor games to create a fun event for people of all ages. Spirit Wear: Anyone can wear a T-shirt emblazoned with the school colors and mascot. Why not have a little fun with school spirit by adding in some face paint or DIY tutus featuring school colors? Crowd Participation: Teens can work together to increase team spirit by preparing crowd participation chants ahead of time. To make sporting events fun, teens can hand out decorative signs, start 'the wave,' or encourage some crowd chants. From heading out to the local movie theater to a binge-watching sleepover, movies are a staple in the social life of teens. Add a unique twist to the classic movie night with these creative suggestions. Backyard Movie: All it takes is a white sheet, digital movie projector and some blankets to create the feeling of a drive-in movie right in the backyard. Cook up some popcorn served with pop and classic candies to further set the mood. Themed Film Festival: Ask teens to choose an interesting theme like cult classics, horror flicks, Oscar winners, or animated movies and host a film festival showing only movies that fit the chosen category. As a bonus, look for movie posters that match the film selections and hang them up near the viewing area. Book or Movie Challenge: Look for books that have been made into movies, those with an original movie and remakes will be the most fun. Ask teens to read the book first, then watch the movie (or movies) and compare. Which was better? What information was changed or left out in the movie version? Some great examples include My Side of the Mountain, The Hunger Games Trilogy, Charlie and the Chocolate Factory, and The Fault in Our Stars. It may seem like teens aren't interested in local tourist attractions, but there are ways to create a fun activity out of any museum or zoo visit. Instagram Challenge: Instagram is a popular app that focuses on telling stories and sharing experiences through the use of photos or videos. See who can create the best image from the trip or who can tell the most creative story using only pictures from the attraction. Another option would be to see who can get the most likes or shares of their images on other social media sites. Scavenger Hunt: Any activity can be turned into a scavenger hunt with a little creativity and preparation. Check if the attraction's website already has an interactive element similar to this. If not, create a list of obscure or obvious items one might find at the specific location. Teens love anything that involves competition, particularly if there are edible or monetary prizes for the winner. Whether hosting a game night or planning for an after school program, there are many great cards and board games that should be included in any teen game collection. Apples To Apples: Made for four to ten players, this party game can be played seriously or with a silly focus. One card featuring an adjective is placed in the center of the playing area. Each player must then choose a noun card from his hand that fits best with the adjective card in play. The judge for each hand then chooses the best noun card. There are several versions of this fun group game, but Apples To Apples Freestyle might be the best choice for teens. Candy Poker: Take any version of the card game Poker and make it teen friendly using candy or snack foods instead of money. A creative, family-friendly version would be to use household chores as currency. Exploding Kittens: A unique card game, Exploding Kittens, is easy to learn and gameplay can be short or long depending on which cards are drawn. The concept is simple; you pick an Exploding Kitten card you are dead and out of the game. That is unless you have a card that can defuse the situation like a Laser Pointer or Catnip Sandwich card. There is now also an Exploding Kittens app so teens can play with their friends even if they aren't in the same room. Magic: The Gathering: This trading card game boasts over 20 million users worldwide. Magic: The Gathering is meant for two or more players, each of whom has a customized deck of cards. Each player is a Planeswalker, and each card is a weapon she can use to deplete an opponent's life energy. Players have the option of in-person or online gameplay via Magic Duels. Pandemic: In this cooperative game of strategy each player is designated as a specialist in a specific field. Players must then use their strengths to stop a series of diseases from wiping out the world's population. Pandemic embraces teamwork and an intense sci-fi scenario which will keep teens engaged. Pie Face: In this thrilling game, players take turns cranking the handle and hope they are lucky enough to end their turn with a clean face. The mechanical hand could go off during any turn, flinging either a wet sponge or whipped cream in the player's face. Teens will love watching family members, friends, or teachers getting a face-full in the hilarious game of Pie Face. Getting outside is a great way to encourage teens to be active and adventurous. Many teens are often so focused on technology; it can be a nice change of pace for teens to see what the great outdoors have to offer. Snow Tubing: Typically a winter sport, people of all ages can enjoy tubing down a steep hill. Ski resorts often offer snow tubing. 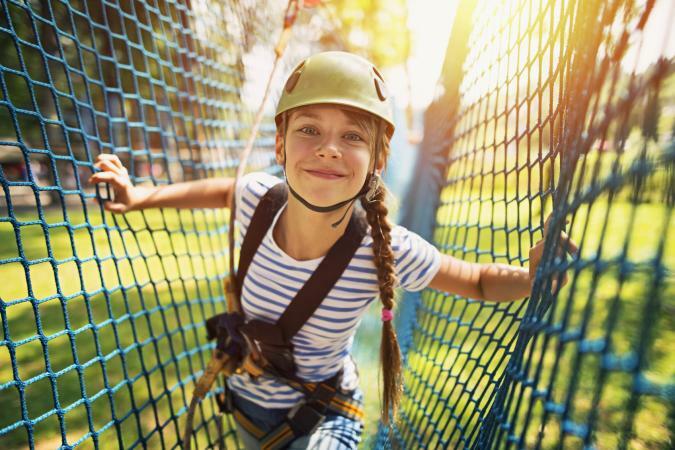 Adventure Course: Adventure courses typically feature a series of platforms at varying levels from ground to treetop that are connected by cable, wood, or rope bridges and zip lines. Reputable courses provide all participants with a safety orientation and secure harness system. There are usually a variety of courses ranging from beginner to advanced so people of all ages can participate. Geocaching: Participants use GPS-enabled devices to search for containers hidden at specific locations. Geocaching feels like a real-life treasure hunt and sometimes includes group activities with other participants. Camp-out: In the backyard or at a local campground, a classic camp-out can be fun for anyone. Bring along some unique campfire recipes, flashlights for a game of tag, and lyrics to favorite summer camp songs to ensure a night no one will forget. Music Festivals: Many towns across the country now play host to music festivals. While media coverage often portrays these events as drug-filled and dangerous, these festivals can still provide fun for teens who are supervised. Look for one-day festivals that feature a variety of artists and stages. Get teens up and moving so their endorphins can start flowing, bringing a smile to any smug face. Active fun can span longer time frames and keep the attention of those easily distracted or bored. 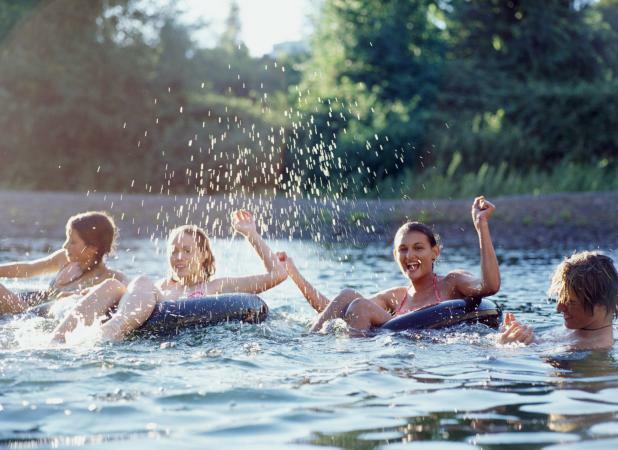 While sprinklers and water balloon fights might seem like child's play, there are many water-related activities teens will be thrilled to dive into. Water Park: No matter the geographical location, there is likely an indoor or outdoor water park nearby. Teens may have outgrown backyard water play, but no one outgrows the thrill of a water park. 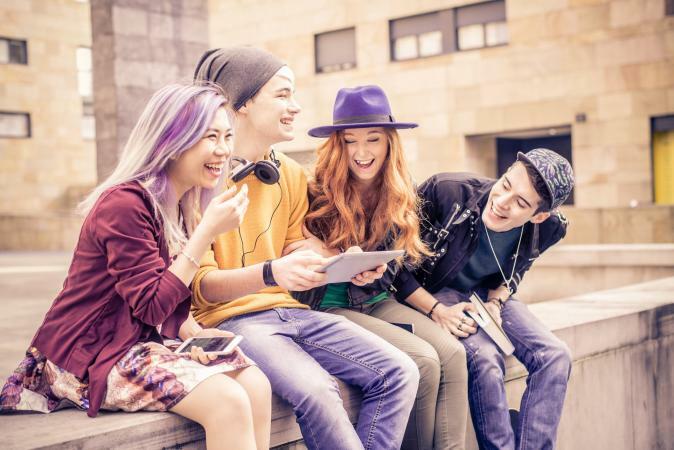 Teens will have more fun if they go with friends and have some freedom from supervision. Consider taking up post in a lounge chair where teens can leave their towels and check in periodically. River Tubing: One step up from the classic Lazy River at the water park, and a few steps down from white water rafting is River Tubing. Each person gets an inner tube and life jacket and usually the option of how long to float downriver. Groups can typically connect their tubes to ensure no one floats away. Many River Tubing companies throughout the United States that offer a wide variety of tube trip options. 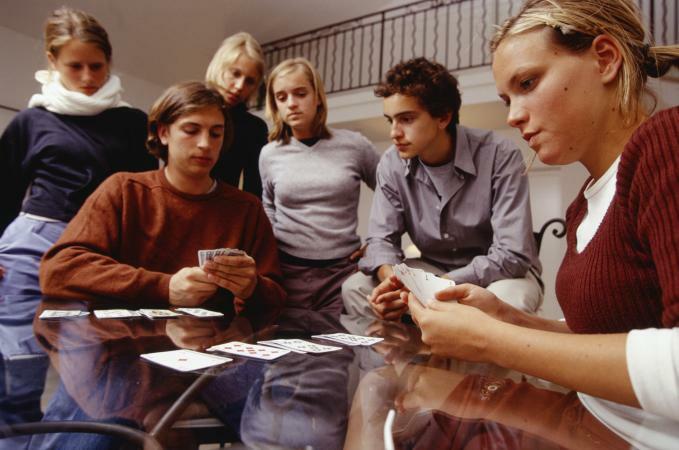 Teens can laze about for hours talking with friends or daydreaming. Water Gun War: Using water guns, soakers and blasters teens can form teams to play a wet game of Capture the Flag. Using a smartphone, players can download the Pokémon Go app then set off on a real-world adventure to find virtual Pokémon characters. Based on the video game, turned trading card game, turned animated television show empire, Pokémon Go combines the fun of a fantasy world with real-world exploration. Teens can play alone or in competition with others as they try to catch as many characters as possible, level up their Trainer and earn digital medals. Mafia: Mafia works best in a group of teens that know each other. Success in the game depends on your ability to lie well and tell if others are lying. Detailed instructions on how to play Mafia and its variations can be found at the website Topped with Meat. Sardines: This childhood game gets a modern, mature upgrade by playing it in a dark building. All players hide in the building except two, who will hunt for the others. The hunters grow in number as people are found. For the sake of safety, be sure to check out the location during daylight and equip players with glow sticks or flashlights. If the rain won't go away or the indoors is simply calling your name, enjoy these fun indoor activities for teens. Themed Fashion Show: If you are lucky enough to have visited Disney recently, you may have tried Disneybounding. If this term is causing you to scratch your head in confusion, know that disneybounding is a term coined to describe the creation of an outfit inspired by a Disney character. The outfits can be simple or elaborate but are usually color-coordinated and accessorized to match a chosen character. Whether you have visited Disney or not, pick a favorite movie and try disneybounding in your own home. If Disney is not your thing, pick a different movie with fun characters you and your friends would like to dress as. Or, if you have parents or grandparents with a penchant for stockpiling old clothes in their closet, you could try a 50s, 60s, 70s or 80s theme depending on which era fits your relatives and what clothes you can find. Rap Wars: Using a phone, you and your friends can compete in rap wars. Take a few minutes to listen to rap music using spotify, pandora, or the smule app and then craft your own raps to perform for your friends. Allow participants time to write the raps or just wing it the way the pros do. The Smule app has an autorap option which will turn your speech into raps if the muse is not with you. The Story of Your Lives: Can you share a story about your life in sixty seconds or less? Allow a minute (use your phone to time) for each player to write down a funny version of the story of their life to read out loud to the group. Alternatively, if you would like a team building or getting to know you exercise, take sixty seconds to chat in pairs and then take a minute to write down the "life story" of your partner to share with the group. Name Word Games: Take the first letter of the first name of each group member and create words starting with that letter which also contain the letters I and N in that order later in the word. (Other letter combinations such as E and D can be chosen) Example: If one player's name is David, then examples of possible words would be: Darling, Duckling, Ducking . Word Play: Make as many words of three or more letters as you can using at least three of the letters from the first names of the players to your left and right. Example: If Kevin is to your left and Elaina to your right you can use the letters K E V I N E L A I N A and example words would be: Vine, Even, Keen, or Linen. Repetitions of letters can be allowed or not allowed as you choose. Time each round using your phone and allow about one minute. There are countless variations of games one and two so feel free to use your own imagination here. A Picture Says a Thousand Words: Do images speak to you more than words? Sit in a circle and decide who goes first. Have the first player draw something on a large piece of paper and pass it to their right. The next player will add something to the picture and pass it on, again to their right. Complete the process until everyone but one player has added to the picture. It is the job of the last teammate to tell a story using the picture as inspiration. Play until each person has had a chance to make up a story or pick volunteers for this role. When the creative juices begin flowing but going to the store and spending your hard earned money on special materials and ingredients seems unappealing, try these craft activities using what you can find at home or at a friend's house. Starburst Wrapper Bracelet: For a fun, fast and thrifty craft which can be made purely from candy wrappers, try this starburst wrapper bracelet activity. Minecraft Iron Sword: Do you need an awesome but cheap piece of artwork for your bedroom wall? For a college dorm room? Create this life-size replica of a Minecraft sword using materials that you probably have on hand at home. Homemade Bath Salts: Turn an empty afternoon into a golden opportunity to create a gift for yourself or for someone else by following this simple recipe for bath salts. Edible Stained Glass: Feeling crafty and hungry? Make a beautiful suncatcher out of simple ingredients that you probably have at home, then enjoy eating the results. Almost anything can be turned into a fun activity for teenagers. However, a little creativity can help even the most reluctant of participants have a great time.